Product prices and availability are accurate as of 2019-04-18 11:15:59 UTC and are subject to change. Any price and availability information displayed on http://www.amazon.com/ at the time of purchase will apply to the purchase of this product. Take your Syma X5, X5C or X5C-1 quadcopter anywhere with peace of mind, thanks to this tough-as-nails drone case! Features foam interior for extra protection against shock. 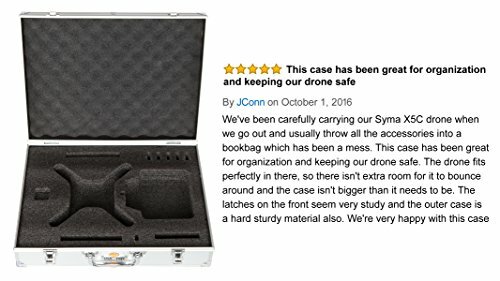 Do you normally toss your Syma drone and accessories into a bag, then fret over every movement as you carry it around? 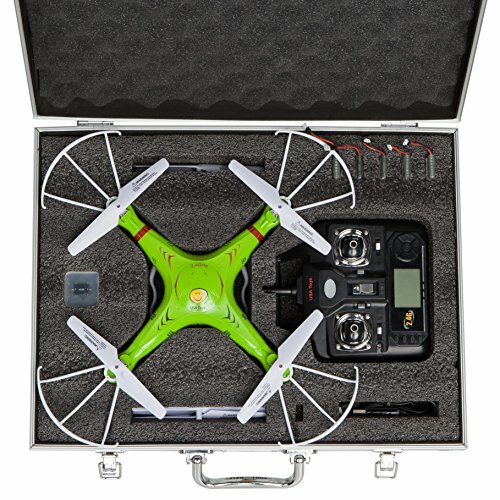 Now there's a worry-free way to carry your expensive remote controlled aircraft-the USA Toyz UX5C Aluminum Drone Case! Constructed of high-grade aluminum, this case is as sturdy as drone cases get. Designed exclusively for the Syma X5C models, it absorbs external shock like champ. Inside, your drone and its accessories (including slots for batteries and parts) are held neatly in place by custom cut-outs in dense, durable foam. They won't shift around and get dinged or scratched during storage or rigorous travel. You won't get this level of protection from any competitor-brand case! 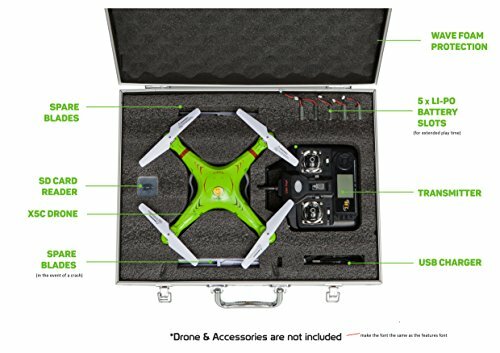 The USA Toyz UX5C Aluminum Drone Case also holds the X5SC-1 and X5SW models, but those should have their landing gears removed prior to insertion into the case (the X5SW camera should be removed as well). 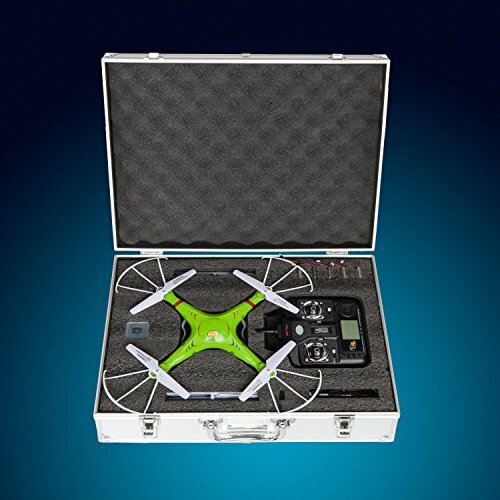 Know someone with a Syma X5, X5C or X5C-1 drone? This drone case makes a fantastic birthday or holiday gift. FITS SYMA MODELS PERFECTLY: Customized for Syma X5, X5C & X5C-1. Fits X5SC-1 and X5SW models as long as landing gears are removed first (X5SW camera should be removed as well). 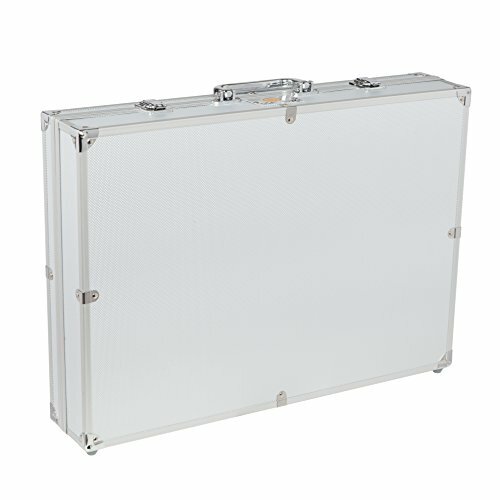 HEAVY DUTY CONSTRUCTION: This drone case is made of durable, high quality aluminum to offer supreme protection. Provides excellent impact resistance to protect your toy aircraft. INTERIOR CUSHIONING: Quality foam inserts lend an extra measure of protection. Many drone case brands do not have this feature! Now you can take your drone anywhere without anxiety. PRECISION CUTOUTS: Cutouts in the interior foam (with extra accessory compartments) organize each drone component. This prevents movement during handling & provides peace of mind. MAKES A GREAT GIFT: This stylish, premium drone carrying case makes a fantastic gift for that special drone owner in your life. Or grab one for yourself!